In the past year that I’ve had my annual National Park pass I’ve hit 24 national parks, monuments and historic sites. Some I’ve spent quite a bit of time exploring, and others have been mere afternoon stops on my way to something else. But the one thing that they all have in common is that they’ve made me more and more c urious and interested in my country’s national parks. Because of this, I picked up The National Parks: America’s Best Idea by Dayton Duncan and Ken Burns to read and learn more about them. The book, which is an off-shoot of the documentary series, is nearly 400 pages long and initially made me think that it’d be a project unto itself to read. But in actuality, I breezed through the book, looking more forwad to the next word than the one I just read, and enjoyed every minute of it. The National Parks is an outstanding, and obviously well researched, book about the history of America’s national parks, and I just couldn’t put it down. And really, as I look back at those 400 pages, I can’t help but think that it wasn’t long enough. 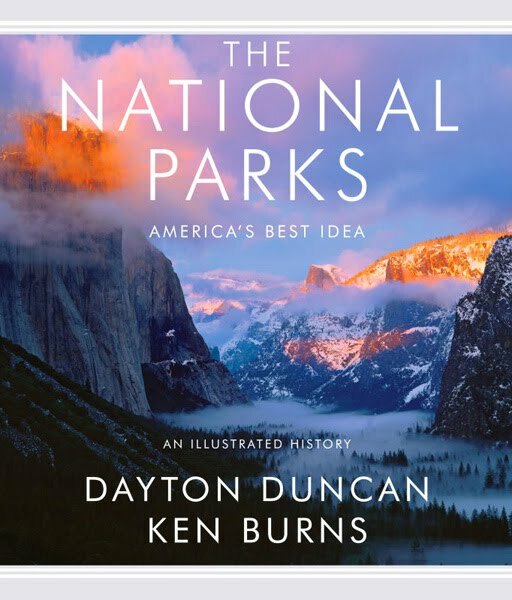 Duncan and Burns delved deeply into the history of the park system in their book, but it focused primarily on a handful of parks with brief mentions of others. And my one disappointment with the book is that there wasn’t more about the other parks, monuments and historic sites. It really left me wanting more and hoping that they do a follow up book to this one. I kept from buying this book initially because it’s expensive. Thankfully though, while staying at the Grand Canyon National Park, I received a coupon for a discount in the park’s stores. Because of this coupon that saved me a whopping $5, I finally decided to pick up the book. I’m glad I did and I enjoyed it immensely. And in recommending it to others, I think it’s best to do so with the stipulation that they’ve first visited a few of the national parks, especially the more well known ones, in order to add some perspective while reading it. The National Parks: America’s Best Idea is hands down one of my favorite books and one that I know I’ll keep out on the coffee table in my living room for years to come. The photography, including some shots by Ansel Adams, is second to none and the writing is just as good. I have no doubt I’ll use it as a reference for years to come as I continue to travel to, and revisit, the national parks both near to me in Colorado and far across to the edges of the United States.